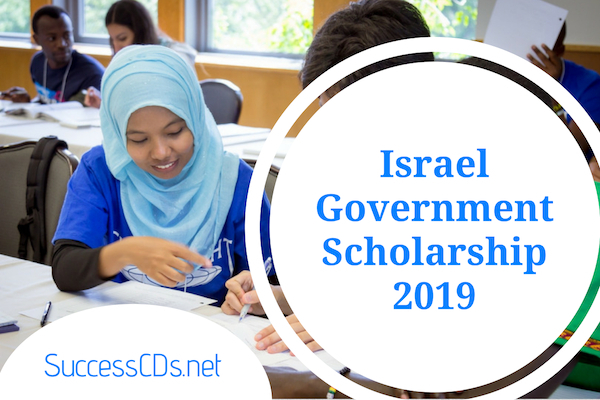 Israel Government scholarship 2019 - Online applications are invited from Indian nationals through MHRD‘s website for the award of scholarship offered by Government of Israel for 08 months research/specialization under Israel Government Scholarship for the year 2019-20. The scholarship is granted only for study in universities and programs approved by the Israeli Council for Higher Education. Candidates who have the letter of acceptance from the supervisor/Israeli university is only eligible to apply. Age: There is no upper age limit for applying for the scholarship. For research/specialization in the field of Agriculture, Chemistry, Biology, Biotechnology, Environment Studies, Economics, Business Mgt. and Mass Communication, applicant must have Master’s degree in the relevant field. iii) monthly allowance for one academic year (8 months only). Accommodation, transportation and travel arrangements to and from or in Israel are the applicant's responsibility. In case there are more number of students than the available nominations, preference would be given to those students who have received letter of acceptance from Israeli institution/university, which ranked higher as per the latest QS ranking of World Universities. Duly filled in application form prescribed of the Government of Israel (application form enclosed). All original marksheet and certificate of class 10 and 10+2, transcript and degree in respect of Bachelor’s and Master’s and all other original degrees and diploma. Self-attested copies of all original documents. Detailed proposal of the research/specialization, which the applicant intends to study in Israel, specifying the University where the applicant wishes to take admission.